The EAOHP renewed its commitment with the European Agency for Safety and Health at Work (EU-OSHA) as partner of European Campaign 2016-2017 “Healthy Workplaces for all Ages”. Campaign was officially launched in Brussels on 15 April. 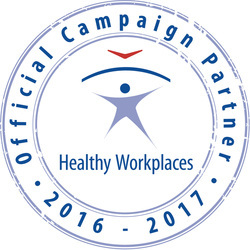 The 2016–17 Healthy Workplaces Campaign promotes sustainable work and healthy ageing from the start of the working life, prevents health problems throughout the working life, and provides ways for employers and workers to manage occupational safety and health in the context of an ageing workforce. The European workforce is ageing. It is estimated that the active population between 55-64 years will increase a 16% between 2010 and 2030, making 30% of the total workforce in 2030. Ensuring a sustainable working life for all ages helps to meet the challenges related to the demographic changes in the workforce. “The proportion of the European population aged from 15 to 64 will drop in the future and this will be associated with a gap between life expectancy and employment expectancy due to the health conditions of workforce, with impacts on companies’ productivities and societal costs.” said Sergio Iavicoli, President of EAOHP “The opportunity of the EU-OSHA Campaign 2016-2017 responds to the need for developing effectively solutions to improve working conditions and foster a healthy active ageing of workers”. ​According to its purpose of promoting the advancement of knowledge and education of the public in Occupational Health Psychology to improve workplace health and wellbeing, EAOHP has announced the official partnership in the EU-OSHA campaign 2016-2017, on the occasion of the Athens Conference (April 2016). EAOHP is one of the over 50 official partners who have committed to raise awareness about the active ageing across Europe. The EAOHP has committed itself to spread the campaign’s message, to promote its activities, and disseminate useful tools across its networks and communication channels. The website of the Society for Occupational Health Psychology, founded in 2004 as a representative body for the discipline in theAmericas, can be found at www.sohp-online.org. In November 2006 in Dublin, Ireland, at the first formal meeting between the European Academy of Occupational Health Psychology and its North American counterpart, Society for Occupational Health Psychology, it was agreed that each organisation will run its international conference on an alternate biennial basis. This ensures a well-paced and accessible conference calendar. The International Co-ordinating Group for Occupational Health Psychology (ICG-OHP) was initiated in 2000 to coordinate international developments in OHP research, education and professional practice. The ICG meets periodically and includes representatives from the European and North American representative bodies for the discipline (EAOHP; SOHP), the two pre-eminent OHP journals (Work & Stress; Journal of Occupational Health Psychology) and supportive organisations (American Psychological Association; National Institute for Occupational Safety and Health; European Agency for Safety and Health at Work). Its website can be found at www.icg-ohp.org.